I don't have a chance to post often, so if I do you know it's got to be good! Just kidding. But this is something useful and easy to make. You may not have time to do it for Christmas gifts this year, but keep it in the back of your brain for next year. If my case, I have to write things down and put it in my planner for next year so I don't forget. 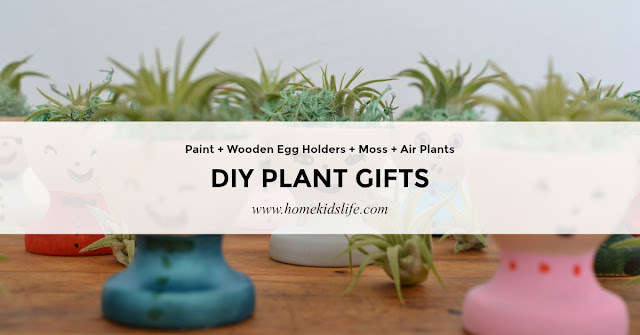 This year my daughter made DIY Air Plant gifts for friends and church workers. Super cute, super easy, and super fun! We ordered miniature wooden egg cups on Amazon (I didn't look at the size and they were much tinier than I thought, but actually worked perfectly!). We also ordered 2 dozen air plants for a very reasonable cost on Amazon. We had the dried moss at home, plus the paint. Paint the bottoms of the egg cups and let them dry. Add faces with paint or markers (she used Sharpies). Add the air plants and surround it with moss (if needed). What easy DIY gifts have you made?